The Classic Car Show and Princess Pageant are popular on Friday night. 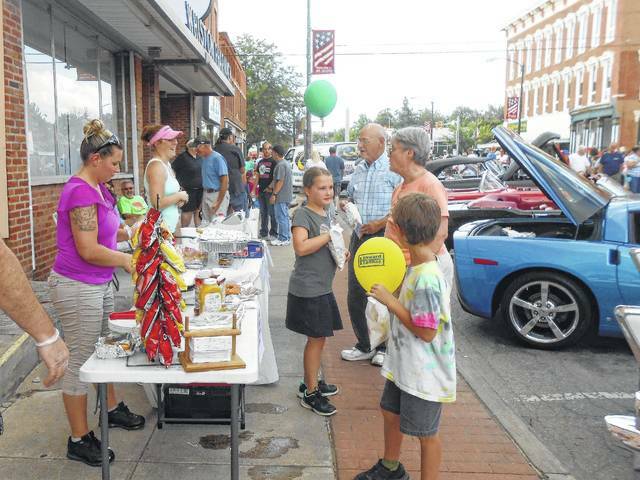 MOUNT GILEAD — Morrow County Chamber of Commerce Director Shelley Planey is excited about both new and traditional events for the Sweet Corn Festival Friday and Saturday, July 21 and 22. Of course corn shucking, and lots of sweet corn will be on the menu all weekend at the festival. Planey invites everyone to wear 50s dress, bring your hula hoop and do the Twist by the main stage. Many downtown stores will be open and vendors will line the sidewalks. EMS will serve sweet corn and dinners while Knights of Columbus will host a beer garden on the square from 6-10 p.m. Seniors on Center will serve breakfast Saturday from 7 to 10 a.m. Saturday events will open with the Sweetcorn 5K at start time of 8:30 a.m. at the Mount Gilead Swimming Pool on North Cherry St. Kids and Kritters Barnyard Parade for kids, wagons and strollers will be held at Seniors on Center with judging at 9 a.m. and the walking parade at 9:30 a.m. Vendors will line Main Street and there will be a Strong Man Competition Saturday afternoon. The Knights of Columbus beer garden will be open from noon to 11 p.m. on Saturday. https://www.galioninquirer.com/wp-content/uploads/sites/38/2017/07/web1_DSCN9804-2-.jpgThe Classic Car Show and Princess Pageant are popular on Friday night.